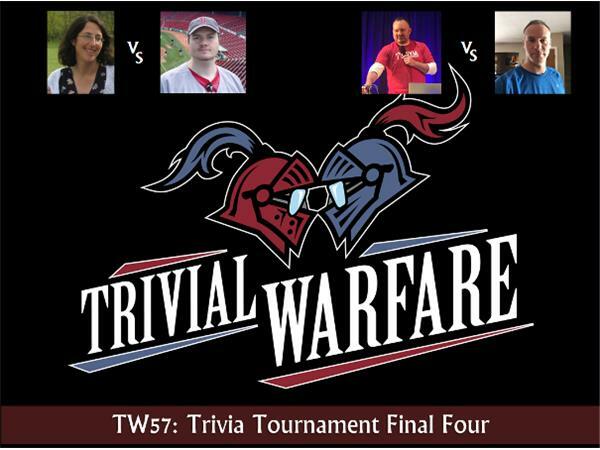 TW57: Trivia Tournament Final Four! It's the Final Four of our Listener's Trivia Tournament. These competitors have each won two games to get this far and the prize is in reach. We start with Scott Barber vs. Amy Ningen. Scott was tested early against Nick Seuberling and then squeaked out a win against Jeffrey Seguritan in one of the best matches in the entire tournament to get here. Amy won her first match against Chris Daly in a runaway and then subjected Jeff Revilla to the same treatment in her quarterfinal match. In the second matchup we have Russ Friedewald facing off against Kris Eve. Russ started the competition with a stiff matchup but managed to win running away and then did it again against Bob Oakes in the quarterfinals to earn his spot in the Final Four. Meanwhile Kris survived his match with John Spahr in Round 1 before shocking many of us by dispatching my normal co-host Chris Hollister with relative ease in the Quarterfinals. Who stands and delivers and who falls to the wayside? You'll have to listen to find out.